We are elated to announce that AgilizTech completed three years of its journey on June 10, 2018. What started as a small aspiration of Mr. Ganesh Babu (MD and CEO of AgilizTech) has taken flight as an upcoming company in the IT services arena. 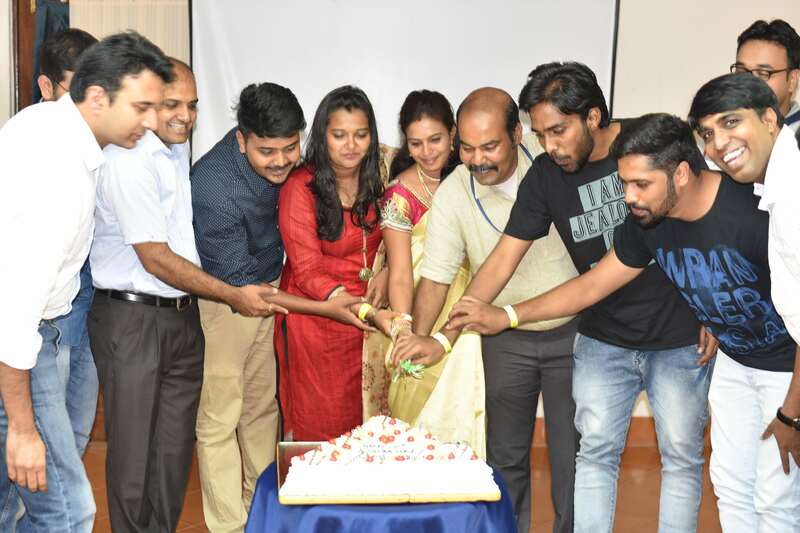 To mark this important milestone, on June 09, 2018, the AgilizTech family congregated at Golden Palms Resort, Bangalore for a day of cheer and celebrations. It was a cloudy Saturday when we assembled at Golden Palms resort. Set amidst lush greenery, the sights instantly refreshed us from the daily hustle and bustle of the city, and the glowing screens of our laptops. It was with this refreshed mindset and a jolly festive mood that the AgilizTech extended family (the team and their family members) gathered for the celebrations. Hosted by Ms. Meghana Manjunath and Mr. Surya Saravana Kumar, the day started on a traditional note with a lamp lighting ceremony in which the guests participated. Mr. Anand Gangoor, Head – Service Delivery at AgilizTech, welcomed the gathering and introduced the chief guest for the day, Mrs. Arundhati Rao, Director at DXC technology, an industry stalwart and motivational speaker, and the other dignitaries – Mr. Alakappan Sreenivasan and Mrs. Deivanai Alakappan Sreenivasan, Mr. Koilraj Jeyasingh (Solution Architect at TCS) and Mrs. Vijaya Bharathi Ganesh. The event proceeded, with the organization updates provided by Mr. Ganesh Babu, Mr. Sujeeth Shetty (VP – Sales and Marketing at AgilizTech), Mr. Anand Gangoor (Senior Technical Delivery Manager) and Mr. Karan Singh (Senior Project Manager). The speakers touched upon the past year’s performance, projects delivered, new customer acquisitions, new product rollouts and employee performance. 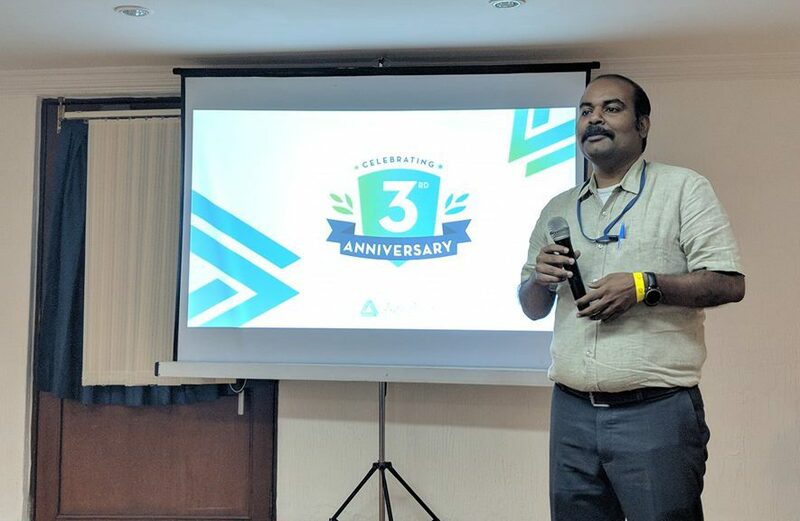 While Mr. Ganesh took us for a stroll down the memory lane and made us familiar with the current company position, and the roadmap, he also gave us the mantra for the year – 3Cs. Aiming to strengthen our technical skillsets, streamlining process and having a razor-sharp focus on customer experience. Improve Productivity, Emerging Technologies & Customer Solutions. Developing innovative solutions using the latest technologies, and reducing repetition and redundancy with a smarter, more productive way of working. Improve service delivery and enhance customer experience thereby gaining recurring customers. Mr. Sujeeth spoke on the importance of upskilling ourselves to serve customers better and take up more challenging opportunities. Mr. Anand elaborated on the service delivery practice at AgilizTech, bottlenecks and solutions, and Mr. Karan showcased the goodwill enjoyed by AgilizTech among current employees as well as aspirants using Glassdoor statistics. Next, the chief guest Mrs. Arundhati Rao was called on stage to present her keynote, which was short yet impactful. Wherein we ought to look at technology as a means to achieve ends. Technology is the great enabler that solves business problems. So, focus on how to end the customer problem, and then pick up a technology that suits the situation. Often, people look at jobs as nine to five’s that pay the bills and keep us occupied. Mrs. Rao urged us to seek more from life by aspiring for higher goals. She stressed upon the point of building careers over holding jobs. In order to aspire and grow, individuals need to acquire and polish skills. In a fast-changing world, where a new technology emerges every other day, it is important to stay updated. While staying put makes one complacent, staying relevant to the industry helps one tap into new opportunities. Mrs. Rao explained that we must all empower ourselves by showing initiative and helming responsibilities even when it is not expected of us. We must not just do a job, we must own it. It was a very inspiring 45-mins speech that motivated us all to be better employees and individuals. We are sure that these nuggets of wisdom from such experienced professionals would help us move ahead in our careers and lives. To recognize the contributions of the employees over the years, AgilizTech presented awards and certificates. The awards were handed over by the guests – Mrs. Arundhati Rao, Mr. Alakappan Sreenivasan and Mrs. Deivanai, Mr. Koilraj Jeyasingh, Mr. Ganesh Babu and his wife Mrs. Vijaya Bharathi. Awards presented to the AgilizTech team members on the occasion of the third anniversary celebrations. 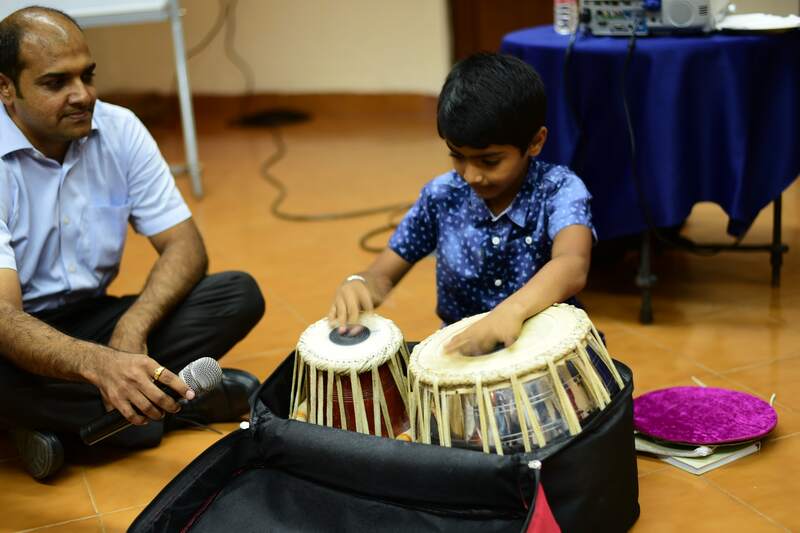 Master Arnav, son of Mr. Anand Gangoor, entertained us all with his tabla prowess. The Dubsmash craze has swept the whole world and we Agilians aren’t immune either. The AgilizTech Fun Committee had asked the entire team to create dubsmashes and submit. It was quite a new way for everybody to let their hair down and get out of comfort zones. The result was a compilation of downright hilarious videos in a mélange of languages – Hindi, Kannada, Tamil and more. The audience thoroughly enjoyed the videos almost as much as the team did when creating them. Apart from dubsmash, AgilizTech Fun Committee had also asked the team to create videos expressing their thoughts on AgilizTech’s third anniversary. What resulted was a beautiful compilation of videos where employees conveyed their heartfelt wishes towards the continued success of AgilizTech. No anniversary celebration is ever complete without a cake cutting ceremony. And we are not ones to be left behind. We had a beautiful 3Kg White Forest delicacy for the AgilizTech third anniversary celebrations, and the whole team participated in the cake cutting. With that the formal event came to an end and the AgilizTech family was free to enjoy lunch and the splendors of the Golden Palms Resort. The swimming pool was a major attraction as a lot of employees chilled in the blue waters. Later the team moved on to the cricket ground for some friendly matches, wherein individuals showcased their cricketing prowess. 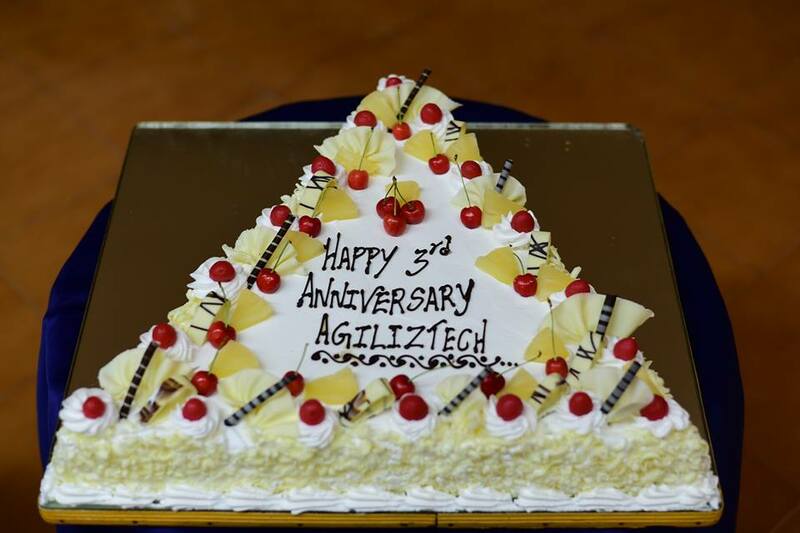 The AgilizTech third anniversary was a day of merriment, motivation and celebration for the entire AgilizTech family. Three years is a very important milestone in our journey, and we will strive to work harder as there are many more miles to go and many, many more summits to climb. We also take this opportunity to thank all our customers, partners and well-wishers who have stood with us throughout this period and provided encouragement and support.